If you plan to spend the summer sailing on other people’s boats, here are some pointers to help ensure that you’re invited back. Promptness – Be early or on time. No one wants to miss a race start waiting for crew, and you don’t want to arrive after the ship has sailed. Shoes – Non-skid soles only! If you don’t have boat shoes, be sure they have rubber soles. 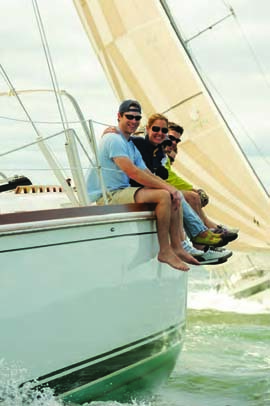 Street shoes will scuff and damage most boat decks – even if they’re teak! Gear – Bring your own life vest and foul weather jacket. Your host will likely have extra life jackets, but they may not be your size. If you plan on spending a lot of time on the water, you may want to invest in a personal locator beacon (PLB). Food & Beverages – Always offer to bring something to eat and drink. It’s as simple as asking, “What can I bring?” Even if your host says, “Nothing,” it’s good manners to show up with a six-pack of your preferred beverage. If you’re unsure about taking alcoholic beverages aboard, ask. Using the Head – Don’t be shy about asking about the operations of the head. Your host would rather show you than find your mess later. Be alert! – Watch out for tacking and jibing sails and booms. There are usually lines laying in the cockpit, so watch your step. In foul weather, don’t forget to tether. Remember, one hand for you and one for the boat. Companionway – When heading below, take the stairs backward – toes facing aft. Heading down in a forward position is an accident waiting to happen. Clean Up – Always help with the clean up. Keep your personal gear together and clean up after yourself as you go. Remove your trash as you leave the boat. Continuing Education – Keep improving your skills, either through a level-appropriate learn to sail program, safety classes or seminars. Attitude – Nobody wants to hear about how great you are or the latest drama in your life. Leave the gossip at home. Thank you – This might seem obvious, but you’d be surprised how often it’s forgotten. « Time for a Maine Cruise?